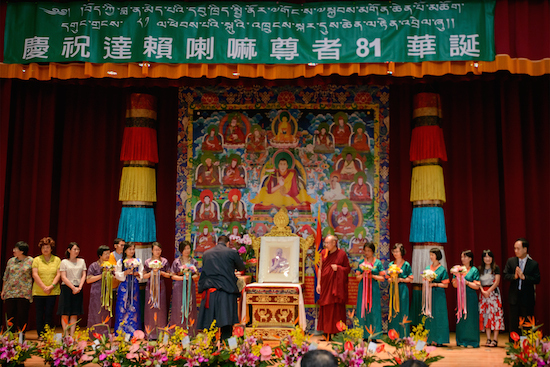 (TibetanReview.net, Jul05, 2016) – With prayer services, musical concerts, a photo exhibition and film screenings, the Taiwan Office of Tibet on Jul 2 held a reception in capital Taipei to mark the 81st birthday of Tibet’s exiled spiritual leader, the Dalai Lama. Other photo exhibitions as well as film screenings and musical concerts are being held to mark the grand occasion later on as well. The office said close to 600 people, including Tibetans as well as representatives and members of over 35 Tibetan and Chinese Buddhist dharma centers in Taiwan, attended the event. The venue was the Zhongying building. Following the reception, a week-long photo exhibition titled “Glimpse of His Holiness the Dalai Lama” was opened at the Taipei Film House. The exhibition features more than 50 photos of the Dalai Lama and Tibetan monasteries taken by Mr Zheng Luzhong, who passed away last year. Besides, the office said thousands of people were expected to attend the 2016 Blessing Concert for His Holiness the Dalai Lama being organized by the Gaden Shartse Centre in Taipei on Jul 6 at the National Dr Sun Yat-sen Memorial Hall. The Centre will organize a similar concert in Kaoshiung city on Jul 9.